With big thanks to Silvio Zeppieri from Denon USA and David Morbey at Denon UK, check out the first of a 3 part review of this baby CD scratch deck. The review policy of skratchworx is slightly different - we try to give as many skratchworx staffers a chance to give an in-depth review as we can. For instance - in the case of this Denon unit, I've had first bash at it and give a seasoned tablist but newbie CD spinners opinion. 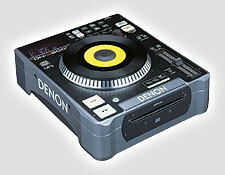 Next it's the turn of Deft who is an experienced tablist Denon DN-S5000 user. And finally ProfessorBX will be casting his scratch-techie eye over the deck as well. I find this deck the most promising out o fthe CD/Vinyl Emulatiors currently doing the round. The EQ point is interesting nevre really thought about that aspect. Looking forward to Deft and BX's reviews. Or should I say 33rpm but 7 inch. Depends on what i'm doing as to where i'll manipulate the vinyl - although i'll be the first to admit i hate scratching at 45rpm - especially on a 7". Still one of my gripes with the Denon to be honest. Even simple rearrangement of scratch sentences seems a nightmare to me at 45rpm. I don't doubt you could adjust to it eventually, but considering i've spent 5 years scratching at 33rpm i find it a bit hard going.